Established in 1975, R.A. Hoffman Construction provides quality remodeling services for both commercial and residential clients. 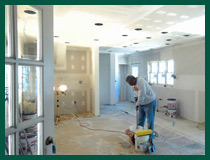 Through the years, we have been able to work on a variety of small and large projects. We make sure to talk one-on-one with every client to understand what their needs are, and then develop a plan to fulfill their needs. We utilize the highest quality of materials in order to provide our clients with the best work possible. With a variety of materials, systems, and methods, we are able to help our clients cut costs and still achieve the look they are aiming for in their remodel. Our team is driven by experience, understanding of innovative construction management, and meeting the requirements that have been set by our clients. We always maintain an open and direct communication between our design team and field personnel. Should something change during the construction process, our design and field team will make sure to share these changes with each other. At R.A. Hoffman Construction, we have the experience and knowledge needed to complete every remodel job precisely. For work you can count on, call us today!